Our planet is a dynamic place. Changing weather events, rapidly shrinking ice coverage in the Arctic and fluxes in ocean temperature impact all of us. These occurrences also bring up a myriad of questions about long-term climate change, short-term weather patterns and their impact on regions like the Arctic. As you read this, NASA’s Suomi National Polar-orbiting Partnership (NPP) satellite system is orbiting the poles collecting and transmitting data to help researches shed light on some these questions. The system, launched almost a year ago, is a first step in creating the next-generation Earth-observing satellite system that builds on previous satellite data collected by the Earth Observing System and other NASA missions. The various instruments that make up the Suomi NPP collect data scientists use to understand everything from atmospheric moisture and pressure to wildfires and ice cover. Dorothy Hall, a NASA senior research scientist and a principal investigator with Suomi NPP, is using the satellite data to study Arctic snow cover, climate, surface temperature and melt in Greenland, as well as other icy research interests. She is responsible for overseeing and performing data analysis to produce remote sensing products for regions in the Arctic that are used by scientists around the world. This month, Dorothy takes time to chat with field notes about the Suomi NPP and what she and her colleagues are learning from it. What do scientists hope to learn from the Suomi NPP system? Scientists in many different fields will utilize the Suomi NPP VIIRS data to study various aspects of the Earth as a system, including the atmosphere, geosphere, oceans and cryosphere. It’s important to extend results from prior instruments that have successfully provided essential Earth science and climate-related data. MODIS instruments have been providing medium-resolution data since early 2000, and [Suomi NPP] VIIRS will extend that extraordinary record. Why is it important to explore earth’s polar regions with satellite technology? Field work in the polar regions is expensive and can be dangerous. Furthermore, in the field, one cannot see the complete picture as can be seen from space. Ideally we need a combination of field and satellite data to study features such as the Greenland ice sheet, ice caps, smaller glaciers, snow cover and sea ice. With satellite data from different parts of the electromagnetic (EM) spectrum, we can monitor these features year-round (and even through darkness and cloud cover) and at times when it’s not possible to have people on the ground. What types of data does Suomi NPP collect? The Suomi NPP VIIRS instrument collects data in the visible through infrared (IR) parts of the EM spectrum. Visible and near-IR data allow us to measure snow and ice extent and reflectance, and to study movement of sea ice, changes in snow cover and surface melt on the Greenland ice sheet, for example. IR data allow us to measure the temperature of the ice and snow surface, and to calculate and monitor melt extent on glaciers and the Greenland ice sheet. What can satellite observations of events occurring in the Arctic tell us about the rest of the planet? Satellite observations of the shrinkage of the Arctic sea ice during the summer months, and the expansion of surface melt on the Greenland ice sheet, tell us that the Arctic is warming at a rate that is greater than the rate at which much of the rest of the globe is warming. If this warming continues as predicted by models, then we can gain further insight about the consequences of global warming by studying the Arctic. For example, we should be able to determine the amount of sea level rise contributed by melting glaciers and ice sheets. This is important information because as glaciers melt, the meltwater flows to the ocean and raises the sea level. Tens of millions of people on Earth live within 1 meter of mean sea level and global economies worldwide are already being affected by sea level rise. So the events occurring in the Arctic directly affect the rest of the planet. How does Suomi NPP collect data and transfer it back to earth? After almost a year of satellite observations, what has the program told scientists about the Arctic (i.e., are there any interesting findings you can share with field notes readers)? Suomi NPP can also measure snow cover, sea ice and surface temperature of the Greenland ice sheet. It extends the measurements of the MODIS instruments, and provides unique additional capabilities such as utilization of nighttime bands to study the Aurora Borealis (aka Northern Lights). There is high solar activity ongoing now, and the nighttime data provide us with interesting data on auroral displays. Suomi NPP has captured some amazing photos of Earth and the Arctic. One that comes to mind is the photo dubbed “White Marble.” What can we learn about the Arctic from these remarkable images? For one thing, we can see that the polar regions represent a large percentage of the Earth’s surface. We can also see how “bright” and reflective the ice and snow can be. The very bright ice and snow features reflect much of the solar radiation back to space so it’s not available to heat the surface layers of the Earth and oceans. If the ice and snow extent shrinks, as it has been doing, more solar radiation can be absorbed and re-emitted as heat, thus further heating the lower atmosphere. As a scientist, what’s the most interesting part of working with the Suomi NPP? I am particularly interested in looking at records that span several decades that tell us about changes in the Greenland ice sheet. For example, when we measure melt extent on Greenland during the summers, we see that the extent of melt is increasing. Surface temperature of the ice is also increasing. 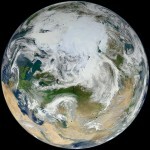 What’s next for Suomi NPP? Suomi NPP extends the vital Earth science satellite-derived records that began in the early 1970s into the future such as snow-cover extent and duration, sea ice extent, sea ice concentration and sea ice age. With over 40 years of high-quality satellite data we can learn much about patterns and trends in features that may be related to, or influenced by, climate and climate change.